2. In a large bowl, combine flour, sugars, baking powder, salt and vanilla. Pour milk into dry ingredients and then stir in melted margarine. Mix thoroughly. 3. Pour mixture into a 9×13 inch baking pan. 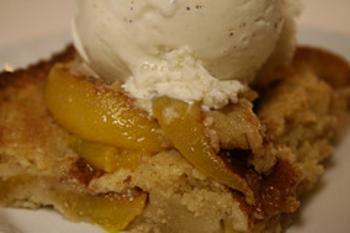 Arrange peaches on top and sprinkle with cinnamon. Bake in preheated oven for 30 minutes. Note: I changed a few things after reading the reviews of this recipe. I doubled the fruit and then sprinkled cinnamon sugar on top before baking. Don't forget to serve it with vanilla ice cream!